This was one of those “how lucky am I?” moments: Suggesting Jerry Goldsmith’s Emmy-winning Americana score for The Red Pony to conductor David Newman for the afternoon performance, and then watching him conduct a new 15-minute suite from it with musicians from the American Youth Symphony. 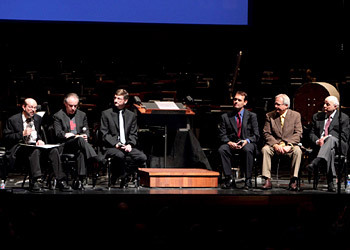 I moderated a discussion afterwards and, that evening, hosted a concert that included some of my all-time favorite Goldsmith: a new suite from Papillon, unused music (to picture!) from Alien, and music from QB VII and The Omen films. We walked out of there saying, “was this all just a dream? !” Here‘s a rundown of an unforgettable evening at Royce Hall. This entry was posted in and tagged " Charles Fox, American Youth Symphony, David Newman, Film Music Society, Jerry Goldsmith Project, Kenneth Hall, Michael Matessino, Papillon, Robert Townson, The Red Pony on May 4, 2010 by Jon Burlingame.